Manuka honey is a highly prized variety of monofloral honey with excellent therapeutic effects. The therapeutic effects of the honey are a result of its strong antibacterial properties which have a direct and beneficial action on respiratory, digestive, immune system and skin health. Eating the raw honey can help manage and even treat a wide range of health issues, from respiratory tract infections, sore throat and cough to gastritis, acid reflux, stomach ulcers, hypoglycemia, low energy levels, fatigue and even poor appetite or difficulty falling asleep. How does manuka honey work? The honey is a source of important elements such as the antibacterial agent methylglyoxal, but also anti-inflammatory elements, antioxidants, enzymes, vitamins, minerals, pollen and other particles, natural sugars, all of which work synergically towards better health. Methylglyoxal, MGO for short, is a natural antibacterial unique to manuka honeys and the secret behind their health benefits and effectiveness. While most other honeys contain hydrogen peroxide as the main antibacterial element, manuka honey has methylglyoxal and it is this particular element that is responsible for the strong antimicrobial action of the honey and engenders other benefits. In order to enjoy all of its benefits, manuka honey has to be raw and unprocessed, especially unheated. As a general rule, when it comes to all honey, any form of processing, be it heating, filtering, liquefying, pasteurizing, adding sugar or corn syrup to make it more affordable, takes away from its benefits. Also, for best results, it is recommended to eat 1-3 tablespoons of the raw honey a day, on an empty stomach for digestive problems and after a meal for respiratory infections (and avoid eating or drinking anything for about an hour afterwards). But remember, always choose certified manuka honey, with UMF or MGO grading systems on the label. Lastly, know that manuka honey changes its properties over time, more exactly, increases its MGO content. 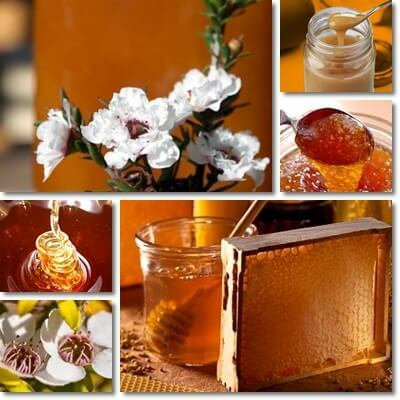 Manuka nectar has been found to contain DHA, a natural sugar or carbohydrate, also found in the honey. This natural sugar is converted into MGO, the principal antibacterial agent in manuka honeys. Research has shown that preserving manuka honey at temperatures above 20 degrees Celsius can slowly increase its content of methylglyoxal over the course of an year. When DHA was added to clover honey and the honey incubated at 37 degrees Celsius, it also formed methylglyoxal (The origin of methylglyoxal in New Zealand manuka (Leptospermum scoparium) honey). However, manuka nectar and the resulting honey made from it start off with varying amounts of this sugar, hence the reason why not all manuka honeys are the same and why they are rated differently on the label, being graded for their antibacterial content. 1) Strong natural antibacterial action. Manuka honey contains a unique and extremely potent antimicrobial compound called methylglyoxal, and has the strongest (non-peroxide) antibacterial activity of all honey varieties. Its beneficial effects extend to respiratory infections, wounds, burns, acne, eczema and other skin problems, digestive conditions such as gastritis, stomach ulcer and acid reflux, all conditions that may entertain bacterial infections. 2) Promotes wound healing. Manuka honey has a strong antibacterial, antiseptic and anti-inflammatory action and actively reduces bacterial load and inhibits bacteria growth, preventing infection and supporting wound healing. Moreover, its acidic pH further contributes to such effects, supressing bacteria growth. Natural wound dressings containing the honey are being considered for a faster healing time. 3) Helps treat eczema and even burns. Because of its effectiveness in supressing bacterial growth and preventing infection, among other benefits, manuka honey has proven itself effective in treating eczema and even burns. But remember, treating a burn doesn’t mean reversing the skin damage associated with it. 4) Aids in the treatment of respiratory tract infections. Eating certified, raw manuka honey can help manage and treat various types of respiratory tract infections, from the common cold and flu to sinusitis, tonsillitis, bronchitis etc. as well as their symptoms. The antibacterial elements in the honey along with its acidic pH and other active components are responsible for such potent effects. A few years ago, I caught a really bad flu virus and quickly developed a bacterial infection in addition to it, but I ate 4-5 tablespoons of manuka honey a day for 3 days I was completely recovered. 5) Calms cough and relieves sore throat. Thanks to its composition and consistency, the honey forms a sort of protective coating over the throat lining, helping calm cough and relieve sore throat inflammation and discomfort. Moreover, it is also a contact-antiseptic and anti-inflammatory that inhibits bacteria growth and soothes irritation, hence its effectiveness in treating a sore throat or calming cough. 6) Helps eliminate cough phlegm. Coughing to eliminate phelgm when we have a respiratory infection can cause extensive discomfort and further irritate the already inflamed throat lining. Manuka honey not only helps us get rid of phlegm, but also calms irritation and inflammation of the throat lining, allowing it to heal. 7) Great food for gastritis. Research reveals the unique antibacterial and anti-inflammatory agents in manuka honey have a gastroprotective action, preventing the inflammation and erosion of the stomach lining and encouraging it to heal itself naturally. Taken on an empty stomach, 1 to 3 times a day, the honey offers relief from digestive discomfort and indigestion. However, eating the right foods for gastritis and avoiding irritating foods is also crucial for successful, long-term gastritis healing. 8) Helps in the treatment of stomach ulcers and boasts prebiotic benefits. Studies show manuka honey actively inhibits the growth of Helicobacter pylori, a bacteria known to cause ulcers. Moreover, its protective action on the stomach lining further reduces the risk of erosion and ulcers. Moreover, the natural sugars in the honey act as food for the good bacteria in our intestines, improving transit, supporting nutrient absorption and promoting overall digestive health. 9) Repairs esophagus in acid reflux sufferers. In acid reflux disease, the stomach contents together with the gastric juices rise up into the esophagus and cause burns and discomfort. Eating raw manuka honey is said to help the esophagus repair itself, similar to the stomach lining healing, as well as reduce excessive stomach acid production. 10) Anti-acne action. How does manuka honey help with acne? Using the honey as a natural face mask regularly helps reduce bacteria numbers, clears excess sebum bacteria feed on and unclogs pores due to its gentle cleansing and exfoliating properties, all of which contribute to an efficient anti-acne action. Moreover, as a result of its good content of vitamins, minerals and especially antioxidants, the honey gives the complexion a healthy glow. What I do I apply the honey on a clean face, maybe massage the skin for two minutes, let it sit for 15-20 more minutes, then face the face with cold or lukewarm water and dry gently with a clean towel. 11) May help with eye styes. It has been reported that applying manuka honey around the eyes helps treat eye styes. This is believed to be a result of antimicrobial elements such as methylglyoxal whose action inhibits bacteria growth. 12) Source of vitamins and minerals. Manuka honey is a source of vitamins (B vitamins and vitamin C in particular), dietary minerals (potassium, magnesium, calcium, copper, zinc, iron, phosphorus, sodium, manganese), amino acids, lipids, pollen particles, phytosterols, beeswax, antioxidants (flavonoids, quercetin, kaempferol, carotenes), natural sugars and other elements with nutritional value, all of which make it a nourishing food and contribute to its beneficial effects. 13) Tonic, energizing action. Manuka is a good food for preventing and managing hypoglycemia, low energy levels and fatigue. Some people even report having a warm glass of milk sweetened with a bit of manuka honey before bed calms them and helps them sleep better. 14) Immune-boosting action. Research shows pollen from honey boasts immuno-stimulating effects, improving the immune system response by increasing the number of white blood cells, reducing inflammation, exerting an antibiotic action, strengthening the immune system and other mechanisms (Bee Pollen: Chemical Composition and Therapeutic Application). Some manuka varieties may have up to 90% manuka pollen (see article on Manuka Honey UMF, MGO, KFactor). Conclusion. Manuka honey boasts several great health benefits and excels as a natural antibacterial. But while it can be a wonderful adjuvant for the treatment of a wide range of health issues, from respiratory infections and digestive problems to acne and fatigue, it does not substitute medical treatment. It is important to always see a doctor first for a correct diagnosis and to discuss our treatment options and pursue an alternative therapy only if our doctor agrees it is a good solution for us.